Whether you are shooting in the studio or outdoors, the Vello RS-P1II Wired Remote Switch provides photographers using select Panasonic and Leica cameras with a simple way to control exposures and an easy-to-use tool to create more "keepers". The device is larger and more comfortable to use than many other remote devices, with a thick, sturdy cord. The RS-P1II is compatible with autofocusing, continuous shooting or single image capture, and long exposures. It will autofocus on a half press of the button and trigger the shutter with a full press. Also, users can press the button and slide it forward to lock it for long exposures. Since you can trigger exposures without touching the camera, you will capture sharp, blur-free images. Additionally, the unit does not require batteries as it draws its power from the camera, making it an extremely useful tool to keep in your studio or gear bag. Box Dimensions (LxWxH) 5.0 x 2.4 x 1.3"
RS-P1II Wired Remote Switch for Select Panasonic and Leica Cameras is rated 4.7 out of 5 by 84. Rated 4 out of 5 by Bryce from Great at 1/5th the cost of the Panny Bought this remote for video. Unfortunately this is more photo oriented, so there is no way to mount it to a pan handle short of tape or elastic bands etc. Would love a better way to mount it. The button needs to be pressed in a fair way before recording will start, which i'm sure is to avoid unwanted shots, however, it does make it a little difficult sometimes to gently start recording. Also quite often when pressing the button, i have moved the lock forward, making it a bit longer process to stop recording. These are however very minor issues, & all in all, this remote does a great job at a fraction of the cost of the Panasonic remote. Rated 5 out of 5 by Paul from Great, low-cost substitute to the brand version I was looking a remote switch for my Panasonic FZ1000. Obviously there is the Panasonic branded version, but the price is quite high for what it actually does. This Vello version provides the exact same functionality at a fraction of the cost. It's well made and the cable length is just right for tripod use. A great value and a must have for anyone doing long-exposure photography or anything where you need to eliminate any possible camera shake. Rated 5 out of 5 by Anonymous from Vello wired remote works just fine I was looking for one to use with a tripod, and this one was the right price and had enough positive reviews for me. First time out of the package, I seriously thought I had plugged in the switch and it wasn't working. I spent a few minutes wondering if there was some special mode I needed to toggle in the camera as there were no instructions. Reread the reviews on here and tried pushing the plug in more firmly and sure enough, I felt a little step as it seated properly and BAM, I have a working remote. It's probably a good thing the remote requires such a firm seating as you certainly don't want it pulling out easily. For the price, you can't complain since it works as intended but one line on the package stating to seat the plug firmly for immediate operation would not have been too difficult. Rated 5 out of 5 by Stan R. from Works great for the Panasonic DMC-FZ200 This remote switch works well with the Panasonic DMC-FZ200, and the price is great! I may save you some time by telling you that there is no plug on the DMC-FZ200 dedicated to a Remote Switch, the microphone plug doubles as the Remote plug. Also, you cannot use a remote switch to start/stop motion picture recording on the DMC-FZ200 or while using the remote stereo microphone. Rated 5 out of 5 by William from Why would anyone pay more? 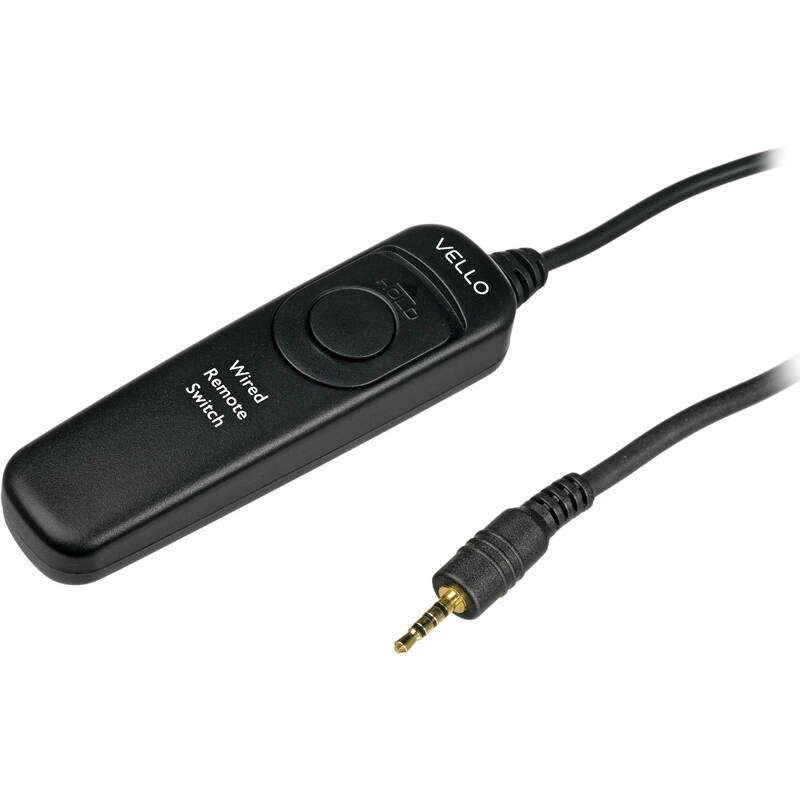 This is my second Vello wired remote (The first being for a Nikon product.) In the case of the Nikon version, I could see no differences except for the price. The unit I just purchased is for my Panasonicnic GX8. It is a very high quality product and much less costly than the Panasonic remote. Only minor difference I could see is the Panasonic version has a right angle plug and the Vello jack is streight. The Panasonic remote is priced obscenely high. I would and have highly recommend this product. Rated 5 out of 5 by George from Nice Remote, works with photo and video This remote has a button lock for timed exposures, however I use it primarily for trigging the Atomos Ninja Flame I have connected via HDMI to the GH4 camera. Although I have read reports the other remotes do not function the video record, this works perfect with my setup. Remote plugged to the GH4, Atomos Ninja Flame connect to the GH4 (HDMI), with the proper setup in the Flame and camera, it triggers the Flame on and off. Nice. Rated 5 out of 5 by William from An excellent low-cost solution to operating the GH4 remotely I use this remote control mostly to start and stop video recording without touching the camera, especially if it is in a cage or on some other rig. Another use is for my long- exposure stills. The RS-PIII performs exactly as I 'd expected: reliable, easily learned as to locking and unlocking its button, lightweight, compact and requires no internal battery. So far, I have not encountered any problems with the unit. Rated 5 out of 5 by Anderson from inespensive solution It plugs right in to the camera and works without any additional in camera settings. It functions just as the shutter button on the camera. If you press it half way down it focuses. If you press it the rest of the way it takes a picture. One nice feature is that it has a lock down for the shutter button. This is handy if your camera has a bulb feature. You just lock the shutter button down and walk a way until you are ready to end the exposure. You can also use the lock down for continuous shooting if the camera is in continuous shoot mode. Will this remote switch work with no problems with the Panasonic Lumix DMC FZ-200? Just as well as the Panasonic DMW RSL1? This Vello remote will be fully functional with the DMC-FZ200 just like the DMW-RSL1. B&amp;H: Can you confirm if this works with the new FZ2500? Thanks! Yes it will work with the new FZ2500. Is the Vello rs-p1II compatible with the Panasonic LUMIX fz300? I had an FZ30 a while ago (and now use 2 G85 bodies) - and yes this remote control works with the FZ30. In response to Edward S. comment that he wishes the cable were a little longer, that is true if you want to operate the camera at considerable distance, eg. bird photography at a feeder from inside the house, but it is not intended for that, but merely for opoerating the camera on a tripod, at slow shutter speeds, without shake from pushing the shutter button. If you need more distance, there are several, not very expensive, wireless remotes available. Where does it plug in on my FZ100? There does not seem to be a female round input? On the FZ100 there is a door on the left side (as viewed from the rear) of the camera that hides a number of ports. The top one is a combined microphone/remote jack, which will take the plug of the remote (which means you can't use it and an external microphone at the same time). See p. 10 of the manual for a diagram. Will this start/stop video recording function on the Panasonic GH4? This will start and stop video recording on the GH3 and GH4. It is common for these remotes to develop a problem where it will do as one reviewer said and perhaps start recording, but not stop it. It can also be that you have to repeatedly press the button to get it to work, etc. The bottom line is they usually work well when they are new and the price is so good that it is not a problem to replace one now and then when they start to give problems. will this work on FZ2500? WILL THIS WORK WITH THE FZ1000? Answered by: Mother John O. Will the Vello RS-P1II work with a Lumix GX8? Mine does not work with my GX8. It worked a couple of times, after fidgeting with it, but now it does not at all. Assuming a defective one.